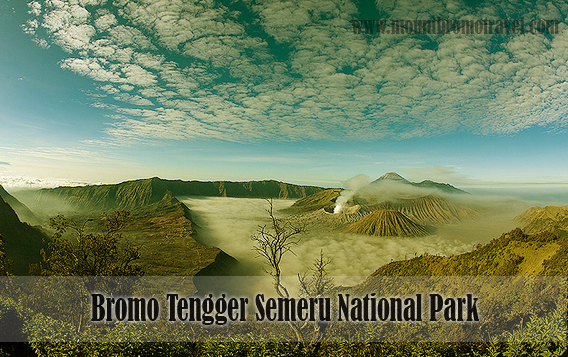 Bromo Tengger Semeru National Park is located on East Java and also a place where Tengger people lived until now. Named after two famous mountains, Mount Semeru and Mount Bromo, this park has more than 5000 hectares near five living volcano mountains. If you learn more about forest area in this famous national park, you will find out that this forest is divided into three groups. They are sub-montane vegetation under 1.500 metres, montane vegetation from 1.500 to 2.400 meters and the last one is alpine vegetation above 2.400 meters. In the top of the Semeru Mountain, there is no possibility for vegetables to grow because it has a very extreme condition and temperature. Animals in the National Park around the area of Bromo Tengger Semeru National Park is a desert or more like a sea of sand. The desert was made from the volcanic sedimentation process from five active volcanoes around the national park. Since those active volcanoes condition and high altitude conditions of this national park, it affects the available animals inside the park. Though there are lots of bird types and species inside the park but there is only few mammalian species for example Javan Leopards and Marbled Cats. If people go to the plateau, they will able to see Hawks and Eagles but it is hard for them to see the Leopard and Deer in the forest since there is only little food for them in there. Tengger people came to this place in the early 19th century to worked here and plant coffee for the Dutch. After Indonesia declared its independence in 1945, Tengger people still lived here with more than 500.000 people and lots of animist form of Hindhuism practice until now. Most people who came to this national park, their favorite destination is Mount Bromo. There are many domestic and foreign tourists come to this place because it has a very beautiful sunrise view and you can use a car to climb the mountain. There is also another fantastic journey for those who come to this place, an incredible hiking experience for about three hours to mount Penanjakan. But before you start your journey, make sure that you wear warm clothes because the temperature is very low before the sun rise. And if you want to climb Mount Semeru, make sure that you and your team already get permission from the National Park office and do not forget to bring local people as your guide. So if you want to go to a beautiful place with lots of adventures, your best choice is Bromo Tengger Semeru National Park.